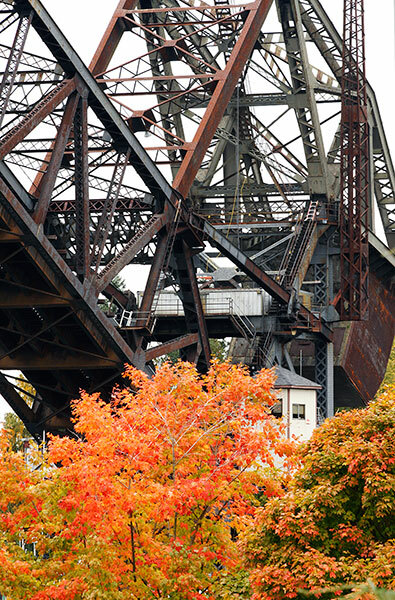 This bridge carries the BNSF railroad tracks high above the Chittenden Locks linking the Lake Washington Ship Canal to Salmon Bay and the Puget Sound. 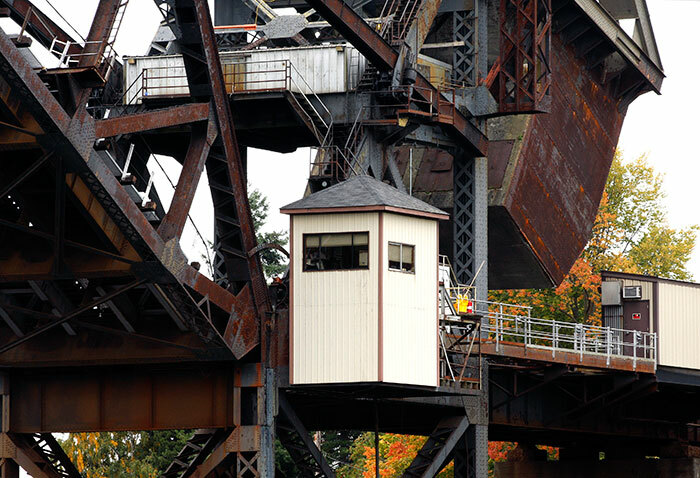 Constructed in 1912 it's a large single-leaf bascule structure with the counterweight placed above the bridge deck: long, slow, freight trains rumble across. Occasional Amtrak Cascades passenger trains link Vancouver with Seattle and Oregon cities to the south. Nearby, a twin- leaf bascule bridge carries Ballard road traffic across the waterway. The CHICAGO BRIDGES gallery contains images of bascule bridges where the counterweights are placed below the bridge deck. 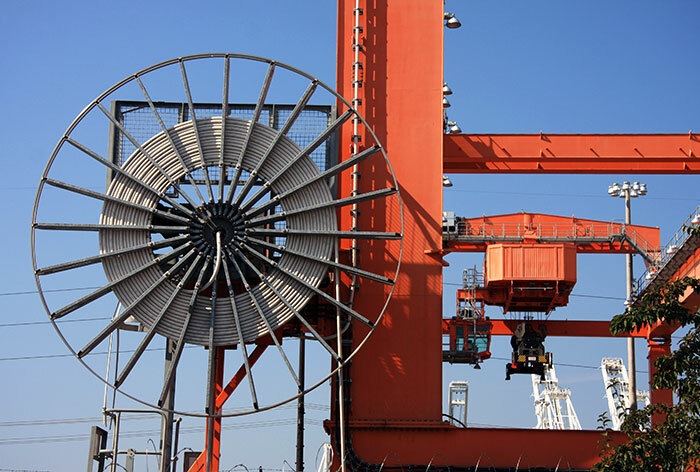 It concentrates on the Bridge Tender Houses from which bridge crewmen open and close the spans to allow shipping to move along the Chicago River. I assume that the small white structure depicted here fulfils the same purpose. Boats and ships passing through the locks, moored at quays and yards and filling the nearby Fishermen's Terminal offer much of interest. 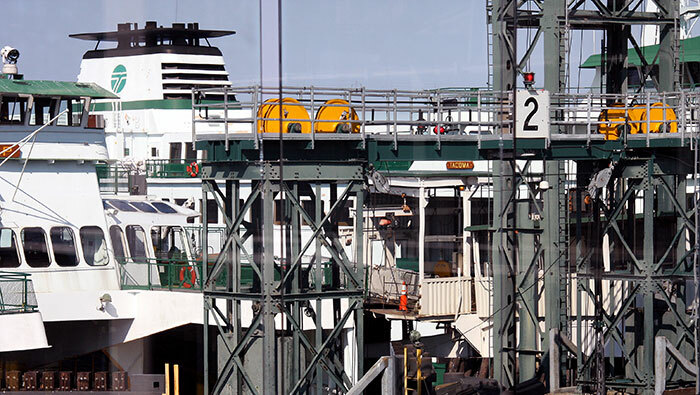 Washington State Ferries sail from a number of ports in the State. From Seattle the principal destinations are Bremerton and Bainbridge Island, both reached within an hour. Waiting to travel by ship or train has anticipatory pleasures often absent from that by 'plane. Waiting briefly on the boarding ramp let me record fragments of its structure, 'my' ferry and that for Bainbridge Island beyond. The seventeen mile Bremerton crossing passes through the wide expanse of Elliott Bay with its docks, cranes and shipping of all sizes and backed to the south by the massive snow-capped cone of Mount Rainier. Sailing further into open water brings the mountain ranges on the Olympic Peninsula more visible before entering the narrows leading to Bremerton. 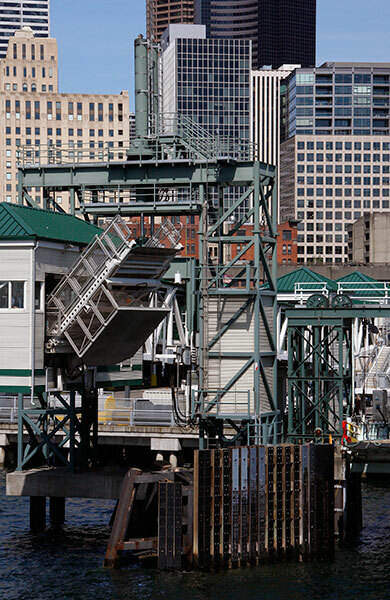 Returning, the voyage at any time of day, year or weather offers fine Seattle panoramas. Here, I was interested in the docking structures. Bremerton is a naval town much altered in recent years with restored and new architecture much in evidence. A large marina and the US Navy dockyards bracket the ferry terminal buildings. The USS Turner Joy, a preserved destroyer in active service from 1959 to 1983 is at nearby moorings: a photograph is in the Boats & Ships gallery. 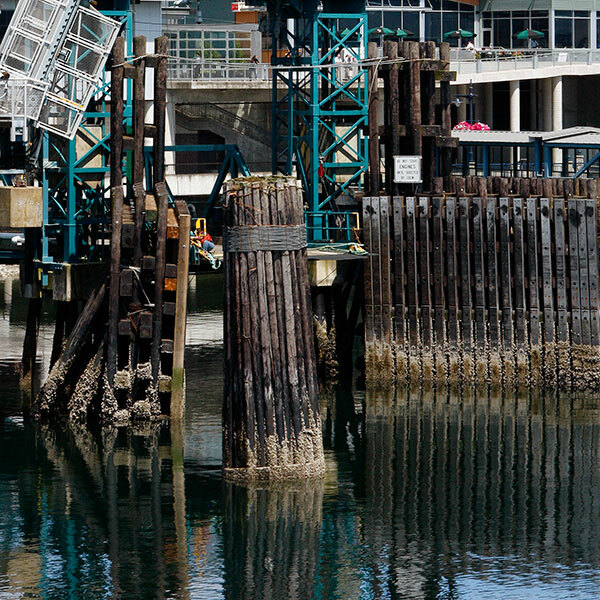 I wanted to record details of forms and materials within the intricate dock structures and their reflections in the smooth water ahead of the ferry. Launched in China in 2010, the MPI Adventure has recently been used in the installation of turbines in the offshore Teesbay Windfarm set in the shallow waters of the North Sea. 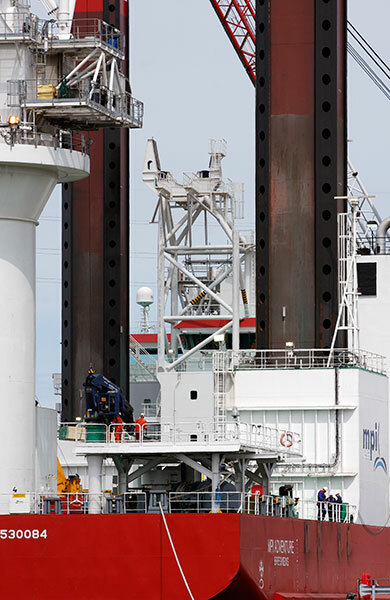 Once in position, the vessel's tall steel legs are lowered to the sea bed and the hull is jacked above the surface to create a level working platform. 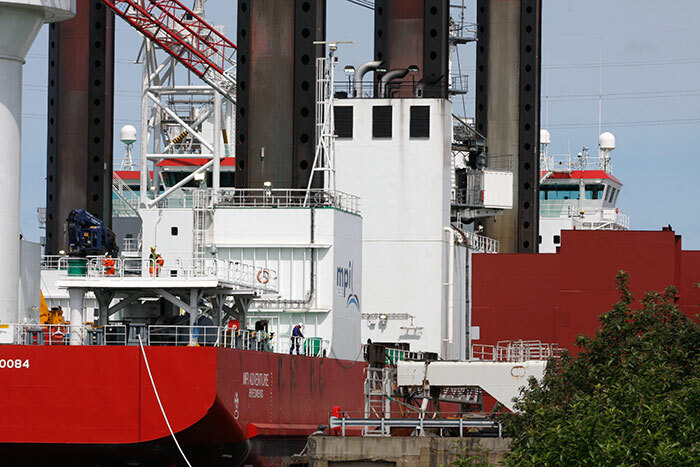 Both images were made from a footpath winding through woodland alongside the River Tees astern of the vessel's mooring and the only accessible viewpoint. The white column to the left is the base of the tall crane used to manoeuvre and place the several parts of a turbine during construction. 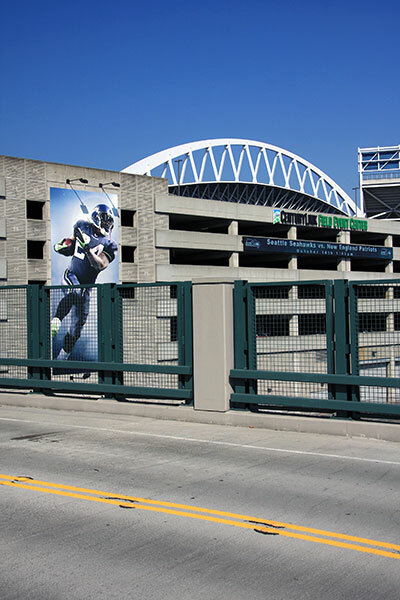 Completed in 2002, the CenturyLink Field is home to the Seahawks who play in the National Football League. 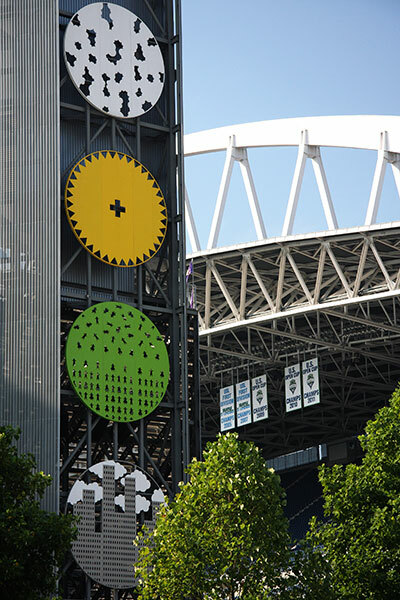 It's built alongside the Safeco Field opened in 1997 and stands on the site of the demolished concrete Kingdome stadium. This detail of the main entrance was framed from Fourth Avenue South across Kings Street Station. South Royal Brougham Way crosses the railroad tracks on a flyover south of the station. This stadium view looks across that elevated road cutting between the two stadia. I was drawn to the geometry of forms and the twin perspective vanishing points created by the right-angle relationship of building and bridge. The yellow, green and blue of lines, railings and sky enliven the sombre concrete grey. The contrasting scimitar of white steelwork links the poster with an echoing rectangle of structure to the right. 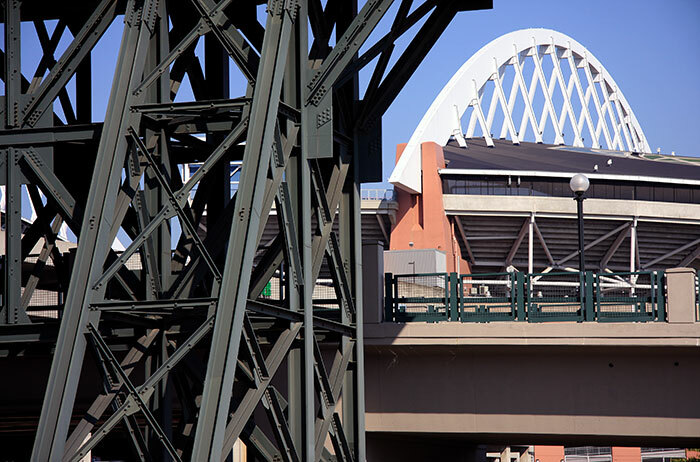 A fragment of the Safeco Field stadium shares the image with the Brougham Way flyover and the CenturyLink Field beyond. The bright light and clear sky of an early September day created sharp detail in this trio of images. I explored further south into the long grid of industrial buildings alongside railroad tracks, freight and passenger train yards and container docks; some of the images made there will eventually be added. Several earlier galleries are devoted to the architecture of Seattle. Whitby is a small port set on England's Yorkshire coast and dates from the seventh century. For twelve hundred years communication was either by sea or over poor roads. In the early nineteenth century and on the advice of the pioneering railway engineer, George Stephenson, a single track railway was proposed to link Whitby with Pickering to the south. His Stockton & Darlington Railway had opened in 1825 as the world's first steam locomotive powered public railway for freight and passengers. Initially horse drawn, the Whitby & Pickering Railway operated trains from Whitby to Grosmont in 1835 and then to Pickering the following year. In 1845 the Company was absorbed into the York & North Midland Railway. The tracks were doubled throughout and extended south to Malton on the York to Scarborough line. A fine new station to the designs of George Adams was built at Pickering. 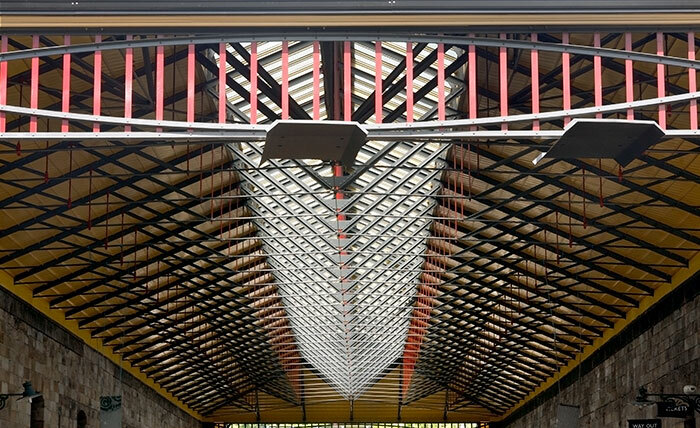 It featured a mansard clerestory roof to create a train shed covering the two platforms and stone station buildings. To cut maintenance costs the roof was removed by British Railways c.1950. 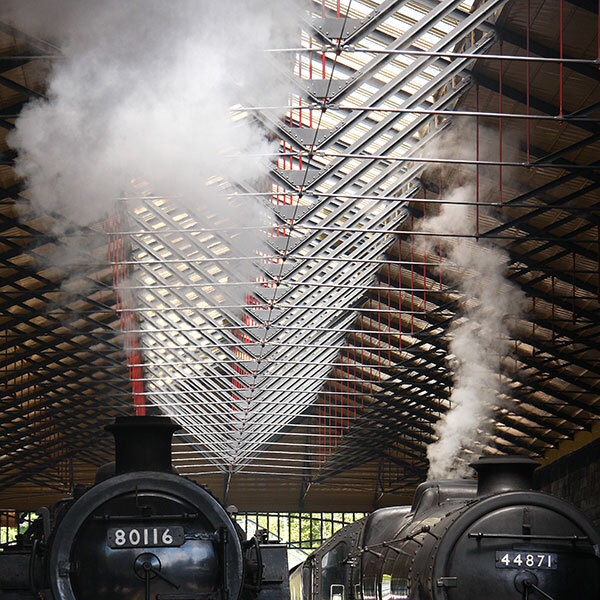 The NYMR raised finance to rebuild the structure to the original Adams designs. These three images were made in summer 2011 just after its construction was completed. The charcoal, red and yellow paint on the elegantly engineered steel and timber structure was in a pristine and soot-free condition. Several Galleries are devoted to photographs of NYMR locomotives. 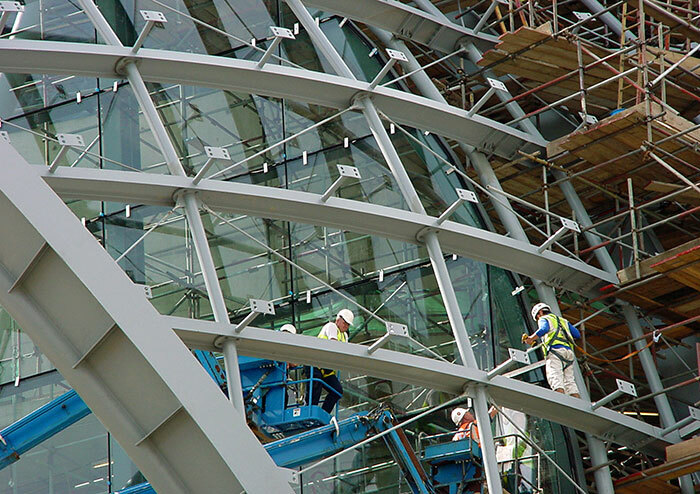 Foster & Partners began design studies in 1997 and construction was completed in 2004. 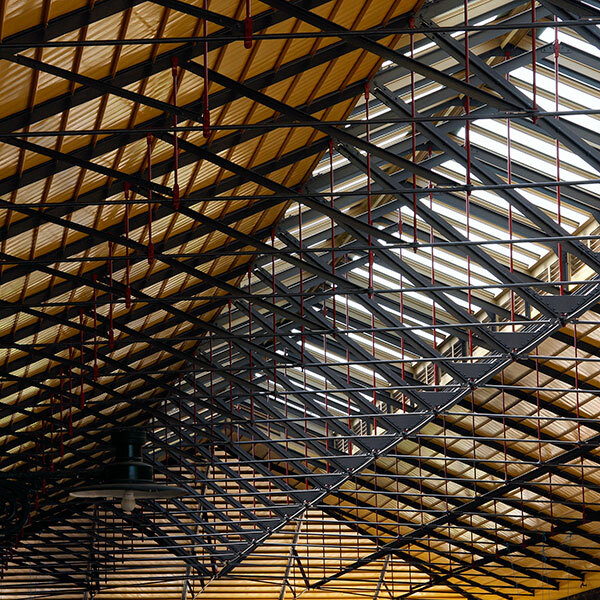 The steel and glass roof soars over the concrete structures housing three principal performance spaces and a Music Education Centre. A voluminous concourse runs the length of the building behind an undulating façade. Very much a welcoming social space, its high setting offers spectacular cross-river views. It's also used for informal music-making sessions and other events. 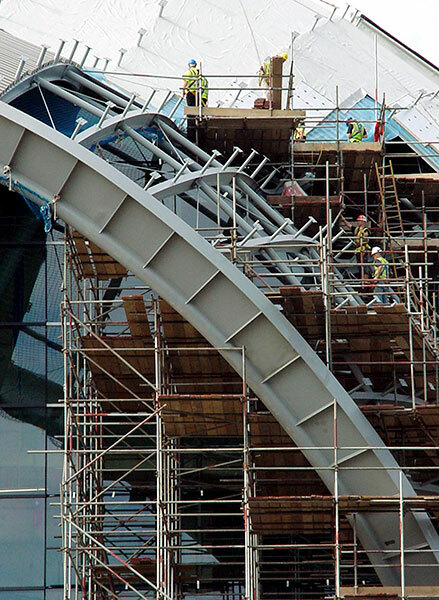 The SAGE GATESHEAD gallery contains a sequence of monochrome images made during the later stages in the construction of the over-arching roof structure. 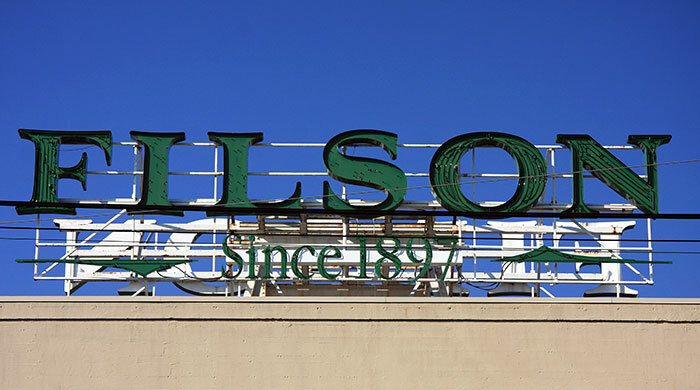 C C Filson's Pioneer Alaska Clothing & Blanket Manufacturers opened for business in Seattle in 1897 at the start of the Klondyke Gold Rush. Clinton C Filson aimed to supply the best quality and most hard-wearing goods for miners and pioneers. It's said that much of their current high quality outdoor clothing and accessories is still made 'behind the shop'. Entry marks a sharp transition from the dust and noise of an industrial street environment to an interior styled in the long tradition of high-end shop fitting in dark wood joinery. King Street Station stands at the northern end of an industrial area designated as SoDo - South of Downtown. 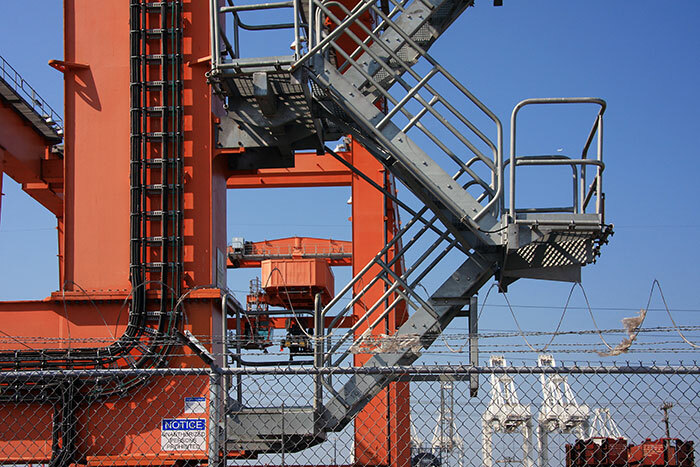 Part of its western edge fronts the Duwamish Waterway where tall cranes unload container ships. Rail yards and train maintenance facilities for Sound Transit and Amtrak and tracks to the south back the waterfront. This and Image 18 show details from a long travelling crane gantry straddling rail lines and photographed for their structural geometry rather than an engineering record. This industrial area cut through by major First and Fourth Avenues is changing in usage, with a growing variety of new businesses moving into adapted and restored former industrial buildings. Restaurants, clothing stores, craftsmen, galleries, and creative firms mix with more usual engineering and construction. Flying activity at the Boeing Field and the aircraft at the Seattle Museum of Flight are further south. It's a fascinating area for walking and photography, offering a great contrast to the nearby city centre environment.